Typhoon is the second generation of Ethernet line cards for the ASR 9000 routers. Second generation of line cards. The Typhoon line cards has similar components to the Trident LC, with the exception of the Bridge. FIB, MAC, ACL, QoS, encap/decap, LPTS, all hardware features, buffer and i/f stats. FIA - stand for Fabric Interface ASIC. 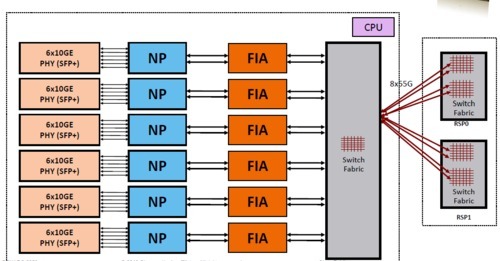 FIA is the interface to the backplane switching fabric. This is where the Virtual Output Queues (VOQs) reside. Different VOQ are generated for different egress port to prevent head of line blocking. EOBC - stand for Ethernet out-of-band channel. 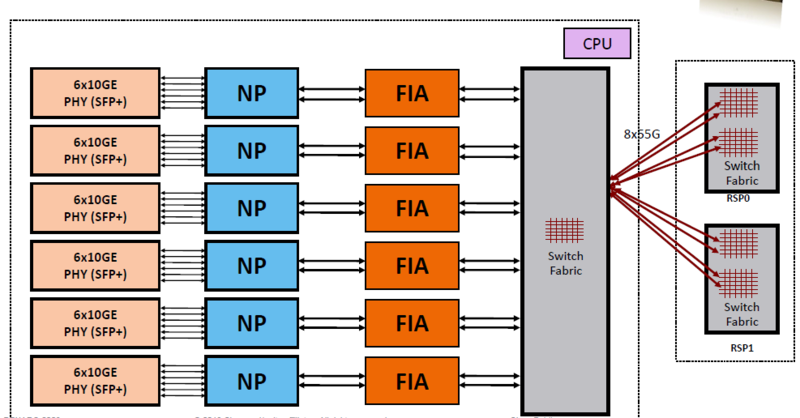 Connects the LC' CPU to the NP and FIA and the RP's CPU. This is an internal 1G switch used for control plane packets. Local Packet Transport Service (LPTS) runs over EOBC for internal communication to the the RP's CPU. 2 port 100 GE, requires CFP-100G-LR4. 1 port 100G, requires CFP-100G-LR4. MOD are Modular Line Cards, which allow you to insert various port adapters called Modular Port Adapters (MPAs). They are still part of the Typhoon generation of line cards. There are two types of MODs: MOD80 and MOD160. Modular Line Card with 80 Gbps and two network processing units. Mapping which port is assigned to which NP can be done with the command show controller np all location. Modular Line Card with 160 Gbps and four network processing units. Modular Port Adapters - most of these fit into both MOD80s and MOD160 with few exceptions based on the bidirectional bandwidth calculation. Show the mapping for the port to NP and bridge.